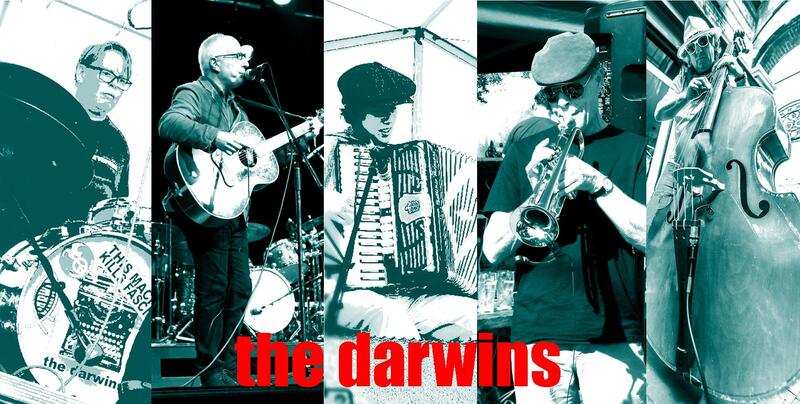 The Darwins were formed in April 2013 with original members Paul Williams on drums/percussion, Geoff Higginson on electric and double basses and Neil Duncan-Jordan on acoustic guitar and vocals. In 2018, the band was joined by Charlie Goodwin on accordion. For live performances and recording they are also sometimes joined by Helen Duncan-Jordan on backing vocals and by the Evolutionary Brass Section. The band prides itself on never having played or even rehearsed a cover song. All the material is written by Neil and arranged by the band. The music draws on elements of soul, jazz and folk and the lyrics deal with both personal and political themes. Above all, the band represent years of musicianship and a passion for quality songwriting and performance. The Darwins play the way music should be: with meaning.